Make storing, organizing, and transporting small to medium-size items easy with mobile bin tote carts. They are appropriate for use in warehouses, hospitals, offices, and all types of applications. 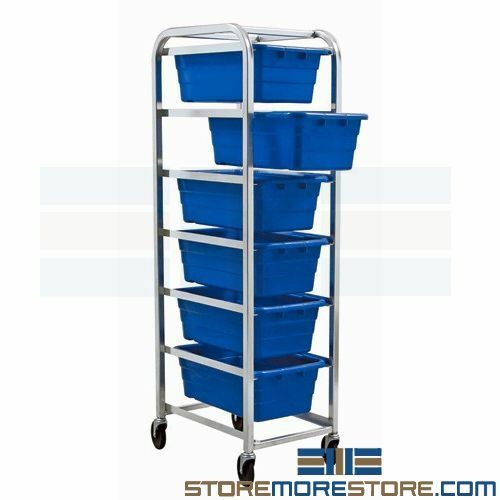 With an all-welded aluminum framework, these durable carts come with plastic storage tubs that easily slide in and out of the cart. 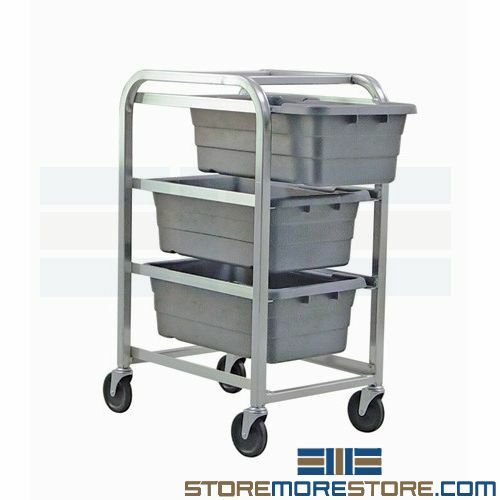 Their durability and ease of use make the mobile bin tote carts great for storing food prep inventory, medical supplies, electronic parts, and more. Additionally, these tote carts can improve ergonomics and productivity in the workplace. For example, users can store related items on each tote level to keep them organized and easy to access. Instead of walking and searching through aisles for each individual item, users can simply access the carts for everything they need. The rack is also designed to allow the totes to be removed easily so users don’t need to take the entire cart if they don’t need it. With an easier and more efficient way to transport materials, employees also use less physical exertion and complete tasks faster. Mobile bin tote carts are available to buy online and ship within 10-15 business days with free dock-to-dock shipping included. If you need any assistance or just want some help picking the right solution for you, please call us at 1-855-786-7667.